Before you buy a Virginia Farm or Horse Farm there are a few things you should know! Thinking about buying a Virginia Farm? Or perhaps a Virginia Horse Farm? You’ve come to the right place! Here at Jump Into Greener Pastures, we’ve put together a great checklist to help guide you through selecting farmland in Virginia, whether you’re a seasoned farmer or just starting out on your first venture. Before we launch into the meat and potatoes of buying a farm in Virginia, let’s look at some Virginia agriculture industry numbers. The average Virginia farm size is 181 acres. Virginia farmland takes up 32% of the state. Agriculture is Virginia’s largest private industry. The agriculture industry generates “$52 billion” annually. Almost 90% of Virginia farms are owned by individuals or families. Virginia’s horse industry generated 16,000 jobs in 2010. There are many, many more numbers we can throw at you, but we hope you get the drift: buying farmland in Virginia and, hopefully, opening up your own horse farm, is a lucrative venture in a great, agriculturally driven state. But you can’t plop down a farm just anywhere. No, you need to do some research. We, of course, recommend getting a good real estate agent to walk you through the process and make sure you get the best farm property for you. However, we’ve created this checklist to give you an idea of some of the things you’ll have to do to set yourself up for horse farming success. You may think that your neighbors don’t matter when the closest one is five miles away, but they do. These are the people that can help you… or hinder you. They know intimately about the land, the weather, and what to do in emergencies. When you find what you think is that perfect piece of land, go introduce yourself. Find out what they do with their farmland, any problems they have, and let them know what you’re thinking of doing with your own potential property. Also, don’t forget to check out county neighborhood websites like this one. Knowing your next-door neighbors is important, but so is knowing the neighborhood. A good county website can tell you all about your future neighborhood: schools, libraries, elected officials, nearest police stations, crime reports, and so on. We all know every living thing on this planet needs water. Whether you are raising horses, cows, or corn, good water is key to good crops or stock. Virginia Tech’s Virginia Household Water Quality Program is an excellent place to learn about getting your water tested. Along with the great information on their site, they also offer clinics that will help you get your water tested. While you’re looking into water quality, make sure to check that there is an ample water supply, and find out if there are sharing rights or if a neighbor has priority. You don’t want to invest in farmland only to discover that it’s dry or you only have enough water to use a quarter of your acreage. It doesn’t matter how pure your water is if there isn’t enough of it. Want to get right to the good stuff? 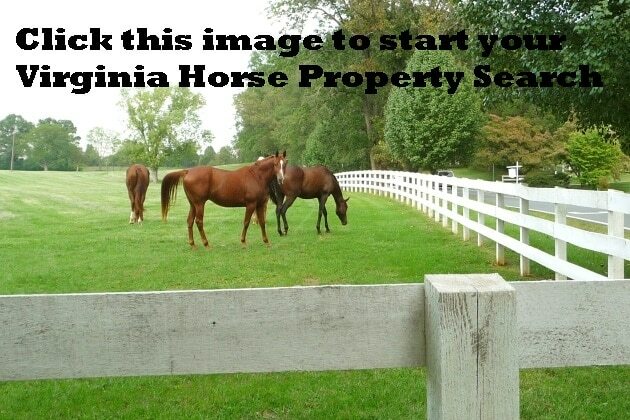 Start your Virginia Horse Farm search NOW! Soil tests help determine how suitable the land is for farming. You’ve tested your water quality, so it’s time to move onto soil—especially if you’re planning on using your Virginia Farm for planting crops. There are many things you need to look for when you test soil, such as alkaline, acidity, and salt levels. You’ll also need to look for signs of bad pesticides or herbicides. Even if sprayed years ago, they can still impact the soil today. Check out this great article from Penn State for in-depth information on soil quality. But where do you go to get your soil tested? Once again, Virginia Tech comes to your aid with their soil testing lab. While your samples are off at the lab, you can do more research by finding out what the previous owner grew, and how successful their crops were. If you’re lucky, they’ll have records of what they grew and where, as well as what they sprayed their crops with. Any Virginia horse farm owner knows that testing the soil is crucial. If you’re looking to start a Virginia Horse Farm, there’s a different soil check you need to do. Horses are greatly impacted by the quality of land they’re raised on. If you don’t have a good foundation, your horses’ strength and health are going to be impacted. Why? Because when horses graze, they take in bits of soil along with the grass. If there are not enough nutrients or if the soil is laced with nasty pesticides, your horses are going to suffer. So do a soil check, just like you would if you were growing crops, but make sure the receiving lab knows that you’re raising horses, not tobacco or wheat. That will let them know to look for different things—horses and crops need different nutrients to be their best. Meaning that a piece of land that tests great for crops may not be good for your horses. You can read more on this topic here. Everyone loves to hate taxes. It is Critical you understand how taxation works in Virgina when you own acreage regardless of its purpose. Now that you’ve learned about testing your prospective Virginia Farm or Horse Farm to make sure it’s viable for your needs, we have to talk about the topic everyone loves to hate: taxes. Most of us have experienced the annoyance of property taxes, so it should come as no surprise that farms will have their own taxes. Don’t stress too much! Due to the migration of many states’ population from farms to cities and the increasing average age of farmers in Virginia (60 years old as of the 2012 census), Virginia has done its best to make farmland taxes easy and relatively cheap in order to encourage new farms. We could go into great detail about farm taxation in Virginia, but then this article would become dozens of pages long. Instead, head over to yet another amazing Virginia Tech page for a lengthy summary. Now that you are on your way to being well educated about farm taxation in Virginia, there’s yet another (hopefully less complicated) financial matter to educate yourself on: CREP. To answer your second question, CREP is a program that offers “financial incentives, cost-share and rental payments to farmers” who promise to engage in particular environmental and water conservation efforts. These efforts usually entail restoring bits of their property to help shield the surrounding non-farmland from the impacts of working farms. To answer your third question, this program is not available for all Virginia farms. If you are completely surrounded by other farms, for instance, it’s highly unlikely that you have any forest or wetland to conserve. The best way to find out if you qualify is to ask your real estate agent, who likely already has that information. Barring that, you to go to your local Farm Service Center and fill out an application. Read more about this great program here. Easements which among other things can affect water access are an important part of acreage due diligence. No, that isn’t a typo. CEP is Virginia’s Conservation Easement Program—totally different than the CREP above. Some pieces of farmland are under agreed upon easements, which means that there are restrictions on what can be built there, or where your animals can access water. Once someone agrees to put their land under easement, even if they sell the property, that land is permanently protected and there is nothing you can do to remove the easement. Make sure to check the easement status of whatever property you’re interested in before purchasing, you don’t want to get stuck with a property you suddenly can’t use in the way you had been planning. To learn more about easements, check out the Piedmont Environmental Council website. These aren’t the only things you need to take into consideration while looking for your perfect horse property or farm, but they’re certainly things you should not disregard. Each property you look at is going to have different benefits and flaws. Doing your best to educate yourself on the major factors is a great step, but when it comes time to start inspecting potential properties, I highly suggest finding a Realtor, like myself, to guide you through the process. I have environmental consultants on hand that perform all the soil and water tests listed above, examine old aerials of the property to make sure there are no nasty surprises (buried oil tanks, anyone? ), and talk to neighbors about previous property usage. You can fill out the form and I’ll get back to you right away.